As many of you here are probably aware, I watch a lot of movies of all different genres and have very eclectic tastes. I particularly love a good psychological thriller, so was pleased I finally got around to watching this on Netflix over the weekend. After fairly successfully avoiding most reviews and spoilers, I went into this knowing only that Dan Stevens and Michael Sheen (two of my favourite actors) were leads, it was a folk horror/thriller set in 1905 and it was written and directed by Gareth Evans, the man who gave us the astonishing The Raid: Redemption (2011). This should have been brilliant. Instead, I enjoyed a solid first act that had promise – but the remainder rapidly spun out of control, devolving into a very incoherent and badly edited mess. I was left feeling that an opportunity had been somehow missed. It made me wonder if I watch too many films. Was I expecting too much, being too picky? But everyone I’ve spoken to about this in the last few days had similar issues with it. I’m also wondering about the uneven nature of Netflix’ original films, though it’s early days still and I hope they keep pursuing their line of quirky, not quite mainstream productions. The sound design starts well, it’s interesting, unobtrusive and adds a lot to the excellent cinematography by Matt Flannery, who’s worked with Evans on all his films. Sadly, the soundscape became increasingly insistent, ending up as tags to tell the audience what they’re supposed to be feeling. This really took me out of the action scenes, which were well done, but when I started wondering how that woman managed to get so much makeup (and be allowed to wear it) in an isolated religious community, I knew I’d been dragged out of the film. 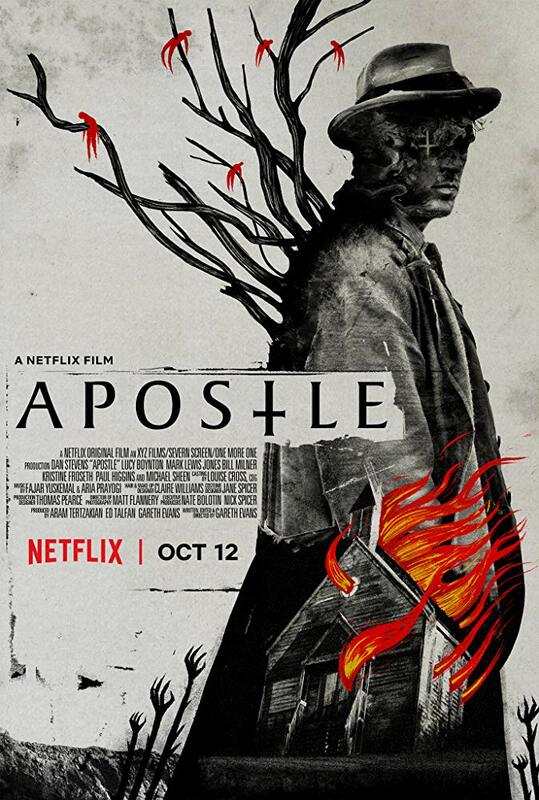 Some of the shot selections were very reminiscent of Ben Wheatley (never a bad thing in my opinion) but the script and editing really let Apostle down. Dan Stevens and Michael Sheen are both top class performers and are fine with what they’re given to work with but I really wanted more of them on screen together, being protagonist and antagonist respectively. Instead, I was left feeling like I’d just seen something that could’ve been really good that ended up just mediocre.